now theres a kiwi/Aussie saying for you! This week our challenge is courtesy of Nikki and it is to just add blokes..so masculine cards are it! Heres what I came up with using the Rev up the Fun stamp set and giving you a sneak peek of the Hessian ribbon available in the next Holiday Catalogue. 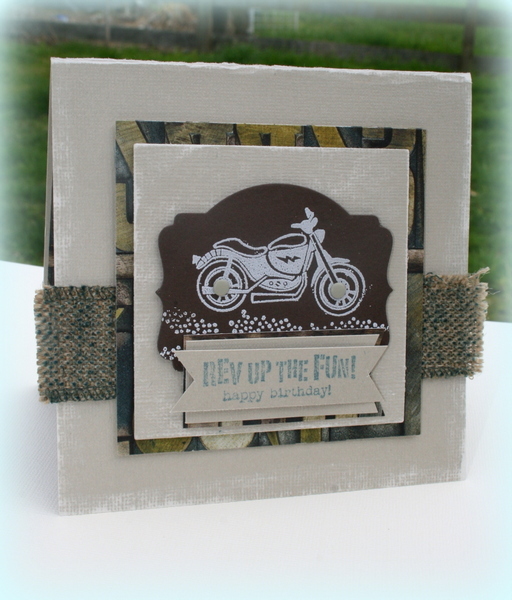 The main image is embossed with the smoky slate embossing powder and Ive used some candy dots for the wheels ..love these! I inked the hessian ribbon with my Island Indigo ink pad and also used Soho Subway DSP and new deco labels framelits. Glad to have this in my stash for the next Male birthday coming up in my household! Hope you come and play! I love this card Delys, so cool and the sentiment looks fun, will have to add this stamp set to my wish list, have pinned it – love it. One very cool masculine card Delys. Funny, I never noticed this stamp in the catalogue before you did this card. Might end up on my wishlist now – thanks! I am loving that big bad boy ribbon too! Great “Blokey” card Delys. Love the use & inking of the hessian ribbon, it works perfectly for a guy card! This is so cool Delys! Fabulous man card!